Limited edition Japanese pressing of the remastered 1964 album features the 10 original tracks packaged in a miniature LP sleeve. Sony. 2005. These are what Dylan once called "finger-pointin' songs"
This album stars Robert Zimmerman as one Bob Dylan, a homegrown American protest folksinger coming out of the backcountry with a keen eye for injustice and a keener ear for memorable, plainspoken lines to expose and excoriate that injustice. 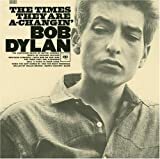 Of course on his very next album that same Dylan turned his back on the civil rights movement at the height of its prominence, influence and power to change the country, which to me does cast just the tiniest bit of doubt and suspicion on the sincerity or at least the fervor of these songs. But with that said, at this point in his career Bob Dylan happened to have a still unequaled ability to say big things with small words, and these songs are the best of their genre. The title track is Dylan's second epochal, anthemic album opener in a row, and it's just as irrevocably tied to and representative of the early '60s as is "Blowin' in the Wind" from the last album. "When the Ship Comes In" is a raspy little ditty all full of lovely imagery all built around a ship's arrival as a metaphor for victory, presumably a victory of the civil rights movement. The moving and rightly classic "The Lonesome Death of Hattie Carroll" captures Dylan the protest singer at the absolute height of his powers to tell a story, paint a picture and a stir up outrage. "Only a Pawn in Their Game" should be a terrible song. In it, Bob uses the recent assassination of Medgar Evers as a jumping-off point to argue that the white Southern elite inculcates and exploits racism among poor white Southerners in order to keep them hateful toward and divided from the poor black Southerners who should be their class allies against that elite. Now that's a theme that sounds like its natural venue is an essay, a political speech or perhaps a scholarly book. So I would expect the thing to turn out as one of those really awkward, unenjoyable folk songs with too many syllables that make me want to throw a typewriter at the singer. But Bob Dylan in 1964 had the lyrical chops to make it work, and it ends up being one of the best songs on a nearly perfect album. I say nearly perfect because "Restless Farewell" is a subdued, unimpressive good-bye that just sort of drags along without ever grabbing or rewarding my attention. But apart from that, my gods, if he would've kept on like this maybe we could have had a revolution. In reviewing Bob Dylan's 1965 classic album Bringing All Back Home (you know, the one where he went electric) I noted that it seemed hard to believe now that both as to the performer as well as to what was being attempted that anyone would take umbrage at a performer using an electric guitar to tell a folk story (or any story for that matter). I further pointed out that it is not necessary to go into all the details of what or what did not happen with Pete Seeger at the Newport Folk Festival in 1965 to know that one should be glad, glad as hell, that Bob Dylan continued to listen to his own drummer and carry on a career based on electronic music. Others have, endlessly, gone on about Bob Dylan's role as the voice of his generation (and mine), his lyrics and what they do or do not mean and his place in the rock or folk pantheons, or both. Here we are going back to the early days when there was no dispute that he had earned a place in the folk pantheon. The only real difference between the early stuff and the later electric stuff though is- the electricity. Dylan's extraordinary sense of words, language and word play has been a constant throughout his career. If much later (in the 1990's) he gets a bit repetitious and a little gimmicky in order to stay "relevant" that is only much later after he had done more than his share to add to the language of music. In this selection we have some outright folk classics that will endure for the ages like those of his early hero Woody Guthrie's have endured. The Times They are A-Changing still sounds good today although the generational tensions and the alienation from authorities highlighted there is markedly less now than than in those days-not a good thing, by the way. The Ballad of Hollis Brown is a powerful tale out of John Steinbeck's Grapes of Wrath about the plight of an up against the wall family farmer out on the then hard hit praries (and it has only gotten worst since and Dylan made one of his periodic 'comebacks' doing this song at a FarmAid concert in the 1980's). With God On Our Side like Masters of War is a powerful anti-war song although some of the tensions of the Cold War period in which it was written have gone (only to replaced today by the fears generated by the `war on terrorism'). Only A Pawn In Their Game was a powerful expression of rage after the murder of civil rights worker Medgar Evers. The Hattie Carroll song shows Dylan's range by dealing with injustice from a different perspective (and a different class) than Only A Pawn In Their Game. But with no let up in racial discrimination in either case. Finally, in reviewing these early Dylan albums (and some of the later ones, as well) I have noticed that they are not complete without at least one song about lost love, longing for love or betrayal of that emotion. Here, there is no exception to that rule with the haunting, pleading voice of Boots of Spanish Leather. 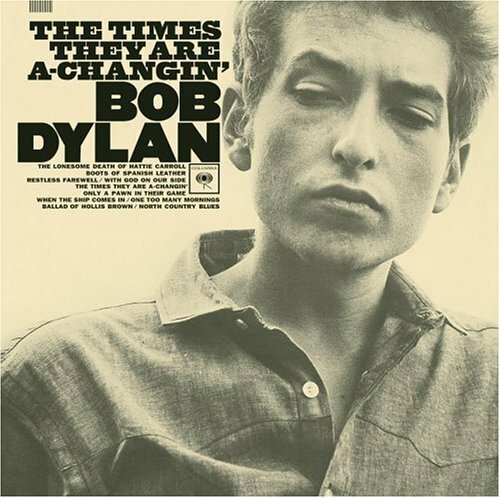 The opening track, "The Times they are a-Changin'" is a call to arms. It was heeded in the Sixties when the streets were filled with protesters, kids who wanted an end to the war in Vietnam. Dylan has sung this song countless times over the years, talking about the battle that is outside raging, but somehow we've forgotten this message, though we sing the words with Dylan at almost every concert he's given on his never ending tour. Sadly there are almost no protesters today. And it seems if one does raise a voice, bad things could happen to him. Mandatory listening for all Americans.